Monotheism (from the Greek: μόνος- One, and θεός -God) refers to the belief, found in a great many cultures, in a single, universal God. Many religions in the world are classified as monotheistic, and the preeminent examples are Judaism, Christianity, and Islam. Forms of monotheism can also be found in other religions including Zoroastrianism, Sikhism, and the Bahá'í Faith. 4 Is Monotheism Violent or Benevolent? Often contrasted with polytheism (worship of many gods) and not to be confused with henotheism (the belief in one god over and above other gods that exist), monotheism is often touted as the highest form of religious belief held by humanity, according to its advocates. The idea of one true God, who is the creator of the world, has been a powerful force in crafting the self-identity and growth of the Abrahamic religions, as well as having galvanized the concept of a shared humanity that is united in religious brotherhood. However, in many cases, the desire to assert the dominion of the allegedly one and only true God has often lead to violence and intolerance. Yet, for as long as humanity has been religious, monotheism has been an important category in the study and practice of religion. Monotheism is perhaps the most discussed and debated category of religious classification. Unlike other religious classifications, monotheism has often been associated with an "ideal" for which all religions should strive. Many faiths have put forward great amounts of effort to champion monotheism, considering it to be the supreme form of religiosity. Monotheism has even been, on occasion, placed on a pedestal in academia—religious scholars and theologians viewed it for decades as the most "rational" way of conceiving of God—and often placed on an evolutionary hierarchy above more "primitive" ways of viewing divinity such as polytheism or animism. The term "monotheism" was coined in 1660 by Henry More (1614-1687), a member of the Cambridge Platonists, in order to better organize and categorize religions on a continuum (as progressing in an evolution from "primitive" levels such as animism through to polytheism, eventually ending up at monotheism). Monotheism was seen as the most "civilized" notion for conceiving of divinity and placed at the top of this hierarchy. Scholars such as Max Müller (1823-1900) believed that monotheistic religions such as Islam and Christianity were reflections of advanced civilizations and advanced levels of thought. Although the theory of "Ur-monotheism" or original monotheism was put forward by Wilhelm Schmidt (1868-1954) in a series of volumes beginning in 1912 to claim, in direct opposition to this evolutionary viewpoint, that monotheism was the original belief of humankind, and that subsequent beliefs such as polydaemonism and pantheism, among others, gradually arose out of the degeneration of this primordial monotheism, nevertheless this theory has been largely discredited in academic circles. Monotheism has been found in a variety of cultures around the world, and is not exclusive to technologically advanced societies. However, scholars dispute the exact origin of monotheism. Some suggest that monotheism first arose in the religion of Zoroastrianism. Others have argued that Egypt was the birthplace of monotheism, while Jews often consider their religion to be the original form of monotheism. Among these theories, Zoroastrianism has wide support for being the earliest example of monotheistic belief in history. Zarathustra founded Zoroastrianism sometime during the long time-span between the eighteenth and sixth centuries B.C.E. by turning against the polytheistic ritualism that was prevalent among Indo-Iranian religions at that time. In doing so, he unified the various notions of divinity found within these faiths into one all-encompassing deity called Ahura Mazda. It is said that Ahura Mazda implements his will on the world by way of six angels, or Amesha Spentas, which represent indispensable moral principles. Ahura Mazda is described as inherently good, just and moral, and as such creates only good things. As for the existence of evil, this is explained by two subsidiary spirits who Ahura Mazda is said to have fathered. Spenta Manyu is the good one, while Angra Manyu is evil; because of the polarity of their natures, these two spirits were said to have feuded since the beginning of time. Thus, Ahura Mazda, while supreme, is not completely omnipotent, as the realm of evil is beyond his control, an idea that lessens the extent to which Zoroastrianism can be considered genuinely monotheistic. However, Ahura Mazda is consistently portrayed as victorious over evil, which marks him as the supreme entity. Hence, Zoroastrianism can be considered dualistic monotheism, a subtype of monotheism where a monarchical God representing good stands opposed to less powerful evil forces. Such monotheism remained prevalent in Zoroastrian belief as Zarathustra taught it; however, later teachings brought older Indo-Iranian gods back into the Zoroastrian mythology, marking it as distinctively polytheist. The Aten cult, which existed during the reign of the Egyptian Pharaoh Akhenaten in the fourteenth century B.C.E., represents another possible origin for monotheism. Those under Akhenaten's predecessor Pharoah Amenhotep IV seem to have worshipped Amen-Re, the god representing the sun, above and beyond all others within a pantheon. Upon inheriting the throne, Akhenaten made the previously unheralded god Aten, synonymous with the solar disk, the single most powerful entity. In contrast to the previous gods that had been primarily the focus of public ritual in temples, Aten came to represent a more personal conception of the divine. With Aten's singular power established, Akhenaten demanded that no other images of god be made save for those of the sun disk. This lead to the iconoclastic destruction of idols dedicated to the other gods. Conceivably, the impetus for such actions was the belief that no other god was tantamount to their preferred deity. Such a theology subtly acknowledges the existence of the other gods, but only as foes to be destroyed due to the fact that they draw attention away from the primary deity. As such, this could be classified as monarchic monotheism, where one god is believed to reign supreme over many gods (see also Henotheism). Zoroastrian and Egyptian monotheism had major influence on the monotheistic religions that would develop in the Middle East. Several archaeologists and biblical critics alike have posited the controversial claim that many stories in the Old Testament were actually developed by scribes employed by King Josiah (seventh century B.C.E.) to rationalize monotheistic belief in YHWH. This theory observes that neighboring countries, such as Egypt and Persia, (despite keeping written records), had no writings about the stories of the Bible or its main characters before 650 B.C.E. Thus, it seems that the Zoroastrian and Egyptian conception of singular divinity may have found its way into the Abrahamic traditions by way of these shared mythologies. Judaism received undeniable influences from various pre-biblical religions of Egypt and Syria. This is evident in the Torah's extensive references to Egypt and Egyptian culture in Genesis and the story of Moses, as well as the mention of Hittite and Hurrian cultures of Syria in the Genesis story of Abraham. One example of such influence could be the iconoclasm carried out during Akhenaten's rule, which represents a possible origin for the subsequent destruction of idols which Moses ordered of the Israelite people as they came to recognize Yahweh exclusively. As well, in a process parallel with the Egyptians, ancient Israelite culture seems to have moved from henotheism to monotheism; just as Aten came to primacy over the other Egyptian gods, so too did Yahweh rise to supremacy. Recently discovered artifacts suggest that in some sections of Israelite society, Yahweh was actually believed to exist within the Canaanite pantheon, among others. Fourteenth-century B.C.E. texts found at Ugarit describe mythical battles between Yahweh and various other Canaanite gods, with Yahweh consistently emerging as the champion. Like the Egyptians' Aten, the victorious Yahweh came to be known in a more personalized form than these previous gods of ritual. Some thinkers, most notably Sigmund Freud (1856-1939), have gone so far as to suggest that Moses was himself an Egyptian, and received the idea of monotheism directly from Akhenaten before bestowing it upon the Semitic peoples. However, the conjecturable historical methodology Freud employed for making such an assertion was extremely tenuous and highly incompatible with the Jewish tradition. The Greeks were also among the first cultures to propound monotheistic ideals, at least in a philosophical sense. Generally, the idea of a unified, divine principle was seen by the Greeks to express a sense of reasonableness or order in the cosmos. For Pre-Socratic philosophers, including Xenophanes, such an idea seemed to be the highest manifestation of religious thought. For example, Xenophanes depicted the spiritual union of the so-called "All-One" as uncreated, unchangeable, and ubiquitous throughout the universe. Plato construed the ultimate principle as a unity of the good, and identified God this way. In a world of evil, in constant flux, God represented the single good, which was ultimately unchanging in its embodiment of perfection. Likewise, Aristotle conceived of a First Mover who derives from physical unity; that is, a solitary supreme being who is one, eternal, and immutable. According to the Bible, Adam and Eve were the first monotheists, but their descendants are said to have become disconnected with this idea over the ages. Instead, the various cultures of the world took to worshipping either idols, animistic natural forces, or celestial bodies by way of astrology, forgetting the one and only true God. Thus, when the Lord promised Abraham the land of Canaan and a legacy of ancestors, he commanded that in return he shall be their lone God. Even Abraham's father, Terah, was an idol manufacturer who served a number of false gods (Joshua 24:2). However, from the age of three, Abraham questioned the divine authenticity of such images. Upon realizing God's oneness, Abraham promptly destroyed his father's idols. Thus, Abraham's monotheistic vision came to represent the key element of early Israelite religion, and served the purpose of combating the rampant idolatry and polytheism that had come to characterize surrounding religions. As such, Abraham and his kinfolk were able to effectively distinguish themselves from other faiths within the geographic region, and propagate their new beliefs. Because of Abraham's efforts to spread the belief in one God after sealing the new covenant, the Jewish tradition considers Abraham to be the father of monotheism. This sentiment is reverberated in both Christianity and Islam, allowing these three monotheistic faiths to be classified under the umbrella term of Abrahamic religions. 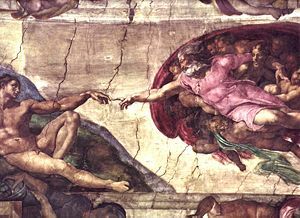 Despite this popular biblical narrative, it is still disputed whether God in the earlier parts of Genesis was one or many. Genesis 1:26 has been the subject of much contention: "And Elohim said, Let us make man in our image, after our likeness: and let them have dominion over the fish of the sea, and over the fowl of the air, and over the cattle, and over all the earth, and over every creeping thing that creepeth upon the earth." Such a verse suggests there were multiple entities involved in the creation of the earth. However, linguistic factors must be taken into consideration. Elohim is morphologically plural in Hebrew, but generally takes singular agreement when it refers to the God of Israel, and yet in this case the "our" and "us" seems to create a presumption of plurality. Whatever possibility of henotheistic or polytheistic intention this verse may suggest is certainly precluded by the contents of the rest of the Hebrew Bible. Throughout the book, in both events and teachings, the aforementioned idolaters and polytheists become the anathema of the ideal monotheistic Israelite religion. God is also quite clear as to where he stands in this regard. For example, when Moses returned with the Ten Commandments, the very first law stated, "you shall have no other gods before me" (Exodus 20:3). Monotheism, then, became the central tenet of the Jewish religion. Many scholars argue that development of monotheism was important for creating a unified state of Israel in the Ancient Near East, where the high god El coexisted with many family, tribal and city gods. A key passage is found in a story in which God appears to Moses in a burning bush and says, "I am Yahweh. I appeared to Abraham, to Isaac, and to Jacob, as God Almighty [El Shaddai], but by my name Yahweh I did not make myself known to them" (Exodus 6:2-3). Scholars believe that Yahweh was the god of Midian and the family of Moses' wife. This story argues that all Israelites really worshipped the same God, but were using different names. Therefore all the tribes of Israel could live together in religious peace. In some cases family gods were more like guardian angels watching over individuals and were prayed to as intercessors, not as gods. To the extent they were worshipped, this would have a form of henotheism. This foundational focus on monotheism continues even today. Judaism claims that the Torah provides the clearest textual source for the introduction and further development of what is often called "ethical monotheism." This term entails two principles: first, that there is one God from whom emanates one morality for all humanity; and secondly, that God's primary request is that people act decently toward one another. Christians believe in the one God of their Jewish origins, but nuance their monotheism with the doctrine of the Trinity. The classic Christian "three in one, one in three" formula was first developed by the theologian Tertullian at the beginning of the third century C.E. Christians generally profess that the one God is manifest in three persons: God the Father, God the Son, and God the Holy Spirit/Ghost. The Father is said to be the God the creator who has been present before time and during creation. The Son, Jesus, is said to be God the savior incarnate in human flesh, an affirmation of the absolute supreme being in real human life who makes possible the redemption of humanity. The Holy Spirit, meanwhile, is said to represent the ongoing revelation touching the hearts of human beings. Despite the idea that these three seemingly different persons manifest themselves separately, the power of the one transcendent God is never diluted or mitigated by their manifestations. While the human perception of God's revelation may change, the one supreme reality of God never changes. Typically, Christian orthodoxy holds that these three persons are not independent but are instead homoousios (a Greek transliteration), meaning that they share the same essence or substance of divinity. However, critics have suggested that the Trinity in itself refers to three separate Gods and, as such, is a form of tritheism. The theological intricacies of the Trinity have caused many debates, and spurred the development of some minority Christian denominations and sects that deny the idea of Trinity, such as the Jehovah's Witnesses and the Unitarians. For the Jehovah's Witnesses, God is the creator and supreme being, while Jesus Christ was created by God. Jehovah's Witnesses believe that Christ, preceding his pre-human existence, was actually the Archangel Michael. They teach that since Jesus possesses angelic (and not inherently divine traits), he has subordinate status to God. Further, the Holy Spirit they claim is God's means of acting rather than the third person of the Trinity. Unitarians, who are influenced by Deism, hold that God is one being consisting of only one person, the Father. Further, they accept the moral authority, but not the divinity, of the son Jesus, bolstering the idea of unchallenged oneness for the creator alone. At the very core of the Islamic tradition is monotheism. Like the other Abrahamic faiths, Islam asserts that monotheism is as old as humanity, and is the ultimate form of religious faith degrading into various forms of polytheism and idolatry over time. However, in Islam more so than Judaism or Christianity, monotheism is the linchpin by which the entirety of the belief system is held together. Islam has a simple but pointed philosophy concerning monotheism: there is only one God (called "Allah") and no others, period. There is no Trinity, as in Christianity, and no claims (such as that in Genesis 1:26) which might suggest numerous creative entities. Rather, Allah alone is the sole entity for worship. There is no existence or supernatural powers to be worshipped other than Allah; Allah is all truth and the source of all creation. Allah created the universe by himself, and is also self-created. His power is not depleted in any way on the basis of what he has created. The utmost determinant of Islamic faith centers on the Shahadah (الشهادة), or the Islamic creed, which declares and affirms Muslim belief in the unity of God (Allah in Arabic) and the prophethood of Muhammad. Its recitation is considered to be one of the Five Pillars of Islam by Sunni Muslims. To bestow Allah's indivisible reality upon another god is considered by Muslims to be a lie, and stands as the only sin which Allah will not forgive. Moreover, rewards and punishment in both earthly life and the afterlife are based heavily on monotheistic worship. With such emphasis of monotheism, then, it is of no surprise that the affirmation of the oneness of Allah is one of the cornerstones in the daily faith offerings of the Muslim worshipper. The oneness of God is one of the core teachings of the Bahá'í Faith. In Bahá'í belief, God is omnipotent, omniscient, and perfect. Bahá'ís believe that, although people have different concepts of God and his nature and call him by different names, everyone is speaking of the same Being. The obligatory prayers in the Bahá'í Faith involve explicit monotheistic testimony. The Bahá'í Faith also accepts the authenticity of the founders of faiths with monotheism such as Vaishnavism, which focuses on worship of Krishna as God, and even what are sometimes interpreted as atheistic teachings, such as Buddhism. Bahá'ís believe in the unity of religion and that revelation is progressive, and therefore interpret earlier non-monotheistic religions as simply less mature understandings of the unity of God. In regards to the Trinity, Bahá'ís believe that it is symbolic of the light from the one God being reflected on pure mirrors, which are Jesus and the Holy Spirit. Since Hinduism is a blanket term referring to a variety of religious traditions existing in India, the types of religious views subsumed under the title are also multifarious. Hindu philosophies include monism, dualism, pantheism, and panentheism, among others. Also, Hinduism has been alternatively classified as monistic by some scholars, and as monotheism by others. Despite the fact that early Hinduism is popularly viewed as polytheistic, monotheistic ideas are very clearly stated in the earliest scriptures of the Hindus, known as the Vedas. The very first book of the Rig Veda states: "To what is One, sages give many a title." Even though Vedic Hinduism is replete with stories of many gods such as Indra, Usha, and Varuna, this quotation from scripture suggests that early Hindu rishis (seers) had already become aware of a deeper, more unified reality underlying the stories of the many gods. Whether this unified reality was viewed as monistic or monotheistic is still debated today. The Upanishads developed this concept of a deeper oneness even further. They labeled this deeper reality as Brahman, which they described as unchanging, infinite, immanent and transcendent reality that is the Divine Ground of all being. This Supreme Reality is regarded as the source and sum of the cosmos; eternal and genderless, yet utterly beyond description. The concept of Brahman in the Hindu tradition could allow the religion to be classified under what scholars refer to as emanational mystical monotheism, where humans come into communion with one ineffable God or monistic principle through various tangible manifestations of that principle. However, this is a point of contention, since Brahman is also beyond being and non-being alike, and thus does not adequately fit with the usual connotations of the word God, and perhaps even the concept of monism. Contemporary Hinduism is divided into four major divisions, Vaishnavism, Shaivism, Shaktism, and Smartism. These denominations all believe in one deity or deities but differ in their various conceptions of God. Vaishnavites conceive of God as Vishnu, and Shaivites conceive of God as Shiva. These denominations, then, can be said to follow a singular concept of God, which would classify their beliefs as panentheistic monotheism or panentheistic monism. Smartas, who follow Advaita philosophy, are monists, and accept each of the multiple manifestations of the one source of being as equally valid. Smarta monists see all the personal gods as unified, representing different aspects of one supreme being, like a single beam of light separated into colors by a prism. Because they are all from the same source, any of these gods are valid for the purposes of worship. Some of the aspects of God commonly worshipped in the Smarta school include goddesses such as Devi and Durga, as well as gods such as Vishnu, Ganesha, and Shiva. It is the Smarta view that dominates Hinduism in its Western incarnation, as Smarta belief includes Advaita. Advaita was the belief of Swami Vivekananda (1863-1902), the first Hindu saint to successfully transport Hinduism to the West, and ever since this philosophy has thrived in the Diaspora. It was not until much later that gurus, such as A.C. Bhaktivedanta Swami Prabhupada in the 1960s, brought the Vaishnavite perspective to the West. Additionally, many Hindus, including Smartas, believe in Brahman as having three aspects as Brahma, Vishnu and Shiva, otherwise known as the Trimurti (also called the Hindu trinity). These different aspects are part of the one and the same God. Sikhism is another monotheistic faith that arose in northern India in the fifteenth century. The opening verse of the Guru Granth Sahib, known as the Mool Mantra, exemplifies their firm belief in monotheism. In English, this statement reads: "One Universal Creator God. The Name Is Truth. Creative Being Personified. No Fear. No Hatred. Image of The Undying, Beyond Birth, Self-Existent." Thus, even before discussing the details of faith and practice, the Sikh holy book proclaims the oneness of God, illustrating the importance of this idea to the faith. It is often said that the 1,430 pages of the Guru Granth Sahib that follow the opening affirmation of monotheism are all expansions on this Mool Mantra. Sikhs believe in one, timeless, omnipresent, and supreme creator. God is the truth that never changes, existing as an independent reality that is also prevalent in worldly forms. God, completely pure in his essential nature, manifests himself within the many earthly forms without forfeiting any of the transcendence that characterizes his abstract nature. In the worldly plane, God creates and preserves the whole of existence by himself. In Sikhism God is seen as the one divine monarch for all people, regardless of nation, race, or gender. This God is the ultimate and final destination of all creatures, since every finite thing, animate or inanimate, was created as a manifestation of God. Thus, material creation is not eternal; however, it is not illusory, either, as in other Indian traditions. Instead, everything in the world is conceived to have been created out of the one God, and thus, everything is itself an aid to the understanding of God in the tangible world. Sikhs attribute many names to God, which serve the purpose of better understanding his various traits. These many names denote the ubiquitous implications of God's immense power, and since they all refer to the same supreme being, they are not perceived as taking away from oneness of God's reality. Further, the use of these names also serves to harmonize the different concepts of God which are present in the various world religions: for example, Sikhs may refer to God as Allah (as in Islam), or even by names of polytheistic gods such as Rama and Krishna from the Hindu tradition. However, these are simply means by which to express the multiplicity of God's oneness in human perceptions, and not affirmations of actual multiplicity of divinity. Wahiguru is the name Sikhs most commonly use to refer to the supreme divinity. Some argue that there are additional ways to nuance the understanding of monotheism. For example, Monistic theism taught by Ramanuja (1017-1137) suggests that the universe is part of God, although there are a plurality of souls within this supreme being. Pantheism holds that the universe itself is God, and the existence of a transcendent supreme beyond nature is denied. Panentheism is a form of theism that holds that God contains, but is not identical to, the universe. The One God is omnipotent and all-pervading, the universe is part of God, and God is both immanent and transcendent. This is the view of Vishistadvaita Vedanta Hinduism. According to this school, the universe is part of God, but God is not equal to the universe. Rather, God transcends the universe. Substance monotheism, found in some indigenous African religions, holds that the many gods are different forms of a single underlying substance, and that this underlying substance is God. This view has vague similarities to the Christian trinitarian view of three persons sharing one nature. Monotheism can also be divided into different types on the basis of its attitude towards polytheism. For example, emanational mystical monotheism claims that all polytheistic deities are just different names for the single monotheistic God: As discussed earlier in the case of Smartism, such beliefs holds that God is one but has different aspects and can be called by different names. Exclusive monotheism, on the other hand, claims that any deities other than the one true God are false and distinct from the one God. That is, they are invented, demonic, or simply incorrect. Exclusive monotheism is also a well-known tenet in the beliefs of the Abrahamic religions. Is Monotheism Violent or Benevolent? Numerous people have observed and commented that monotheistic religions such as Judaism, Christianity, and Islam, in spite of their fundamental ethical and moral guidelines on benevolence and love, have actually been far more violent and intolerant, causing far more wars and conflicts, than non-monotheistic religions. Such negative characters of monotheism have been attributed to its adherence to an absolutist, theological thesis that only my God is God. According to book columnist and author Jonathan Kirsch, who wrote God Against the Gods in 2005, the monotheistic idea of only one God tends to bring forth a strict demand for intolerance of others holding different creeds, and although polytheism may not be entirely free from intolerance, nevertheless monotheism is far more intolerant than polytheism because violent monotheists kill to gain theological as well as political dominance, while violent polytheists do so to gain only political control. It seems that ironically monotheism has been guilty of idolatry which it has been denouncing. Some have argued that "monotheistic idolatry" idolizes the idea of only one God instead of properly worshipping God himself. According to them, however, if monotheism overcomes idolatry, its fundamental teachings on God's benevolence and love will come to the fore, and its problem of violence can evaporate. For example, Emil Brunner held that if we go beyond the idolatrous nature of monotheistic "objectivism" as well as the egotistic nature of "subjectivism," the truth will be revealed as "personal encounter" of love between God and us. In fact, the Hebrew Bible promotes an ethic of charity, generosity, social justice, and peace trying to taking care of the widow, the orphan, the poor, and the foreigner. Similar teachings on love and peace are found genuinely in other monotheistic religions as well. ↑ Italics added. The Restored Name King James Version. Retrieved August 20, 2008. ↑ Dennis Prager, "Ethical Monotheism. "Jewish library. Retrieved April 29, 2006. ↑ The Rig Veda 1:164:46..sacred texts. Retrieved August 21, 2008. ↑ Shri Guru Granth Sahib, section 1, part 1.sacred texts.org. Retrieved August 21, 2008. ↑ Jonathan Kirsch. God Against the Gods: The History of the War Between Monotheism and Polytheism. (Penguin, 2005). ↑ Emil Brunner. Truth as Encounter. (John Knox Press, 2000). Prager, Dennis. "Ethical Monotheism."Jewishvirtuallibrary. Retrieved April 29, 2006. This page was last modified on 14 November 2014, at 17:05.